Everyone feels happy and sad now and then. We all have emotions and feelings. When the negative feelings stay longer in mind and lead us to hopelessness, such disorder of mental power is called depression. Sometimes it vanishes with the means of entertainment and games. But sometimes this state of mind continues for weeks and months longer. At that time if the proper treatment is not given to the patient, the results can be very fatal and dangerous. 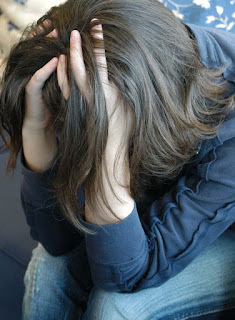 Depression may lead us to the negative thoughts like there is no use of living such a hell life where no body is mine. You may start thinking of committing suicide. Depression is a common but serious illness, and the most people who experience it need treatment to get better. People with a depressive illness cannot merely pull themselves together and get better. Without treatment, symptoms can last for weeks, months, or years. Appropriate treatment, however, can help most people who suffer from depression. The symptoms of depressions vary from person to person. Some may get rid of it easily while some are not able to get over it for a long time. The first symptom is change in behavior. When somebody behaves in a strange way than normally he does. He is supposed to be under depression. Some common symptoms are given below. Change in behavior: Sudden change in behavior is very dangerous and if this state of behavior lasts for a couple of days or for months then the patient must be got treated from a doctor. Negative thinking: Having negative feeling all the time in mind may be depression. You should not ignore it. What is more important is to encourage the patient that life is very beautiful. It is just the result of our thinking which makes us lose interest in life. Death of loved one: This is one of the most important reasons which cause depression. This is because of separation from the person whom we love too much and he is no more. The pain of separation leads the patient to the thoughts of suicide. He just wants to drag his days somehow on this earth. He becomes blue like a faded flower. Tension of work: Tension of work is a very common reason which leads us to depression. Tension of completing the target often makes a man live in tension. The fear of threat: It can be a very common reason for depression. You can judge the condition a person who has been threatened to be shot dead. Selection of wrong field: In life we all choose a particular field of work for ourselves. Sometime we don’t get work according to our choice. At that time the feeling of inferior complexity may hurt you all the time. Wrong deeds: Our own wrong deeds can be very harmful for us. Unknowing we did something and when we come to know the reason then it’s too late to mend In that situation it likely that you may find yourself in a depression mood.